Abstract: This research investigated the effect of brainstorming on students’ creative thinking skills in learning nutrition. The method that was used in this research is quasi-experimental with a pretest-posttest design. The sample was taken by purposive sampling technique where one group was assigned to the experimental group (n=25 students) and the other one group was assigned to the control group (n=25 students). The population was 7th-grade students in Islamic International School in Bandung. The quantitative data in this research was obtained from objective test and verbal TTCT (Torrance Test of Creative Thinking), while the qualitative data was obtained from observation sheet. The findings of the study showed that there are statistically significant differences between experimental and control group in creative thinking skills test with the score of 0.000. The result is in the favor of the experimental group, indicating the effectiveness of brainstorming in developing students’ creative thinking skills in learning nutrition. Abstract: This research was focused on investigating the effect of multiple intelligence -based learning as a learning approach towards students’ concept mastery and interest in learning matter. The one-group pretest-posttest design was used in this research towards a sample which was according to the suitable situation of the research sample, n = 13 students of the 7th grade in Nusa Laila Puteri School in Bandar Seri Begawan. The students’ concept mastery was measured using achievement test and given at the pretest and posttest, meanwhile the students’ interest level was measured using a Likert Scale for interest. Based on the analysis of the data, the result shows that the normalized gain was .61, which was considered as a medium improvement. in other words, students’ concept mastery in matter increased after being taught using multiple intelligence-based learning. The Likert scale of interest shows that most students have a high interest in learning matter after being taught by multiple intelligence-based learning. Therefore, it is concluded that multiple intelligence – based learning helped in improving students’ concept mastery and gain students’ interest in learning matter. Abstract: It is important for people absorbs and understand the information of how world their live in works, as human basic form of learning process, science process skills serve as the tools it is not used only by the scientist in the process of their discovery, but also by the people as tools to understand information about the world. The aim of this study was to profile students’ basic science process skills, to profile students’ integrated science process skills, and the profile of students’ science process based on gender. In gaining the data this study uses observation method in students’ laboratory activity. 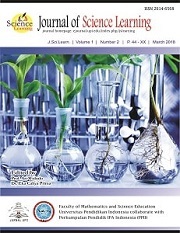 The results of the study indicated that students’ basic science process skills used in the study categorized in a high category with index value above 60%, and integrated science process skills indicators science process used in this study categorized into two categories with; low (23%) and very high (90.7%). There are no differences more than 24% in the profile students science process skills based on gender other than male students did outperform female students. Abstract: This research investigated the implementation of PhET simulation on students’ understanding and motivation in learning the Solar system. The method used in this research was quasi-experimental with matching pretest-posttest group design. The research conducted in one of private Junior High School located at Padalarang, Indonesia with a number of students (n=42). The sampling technique used was the purposive sampling to determine experimental group with PhET simulation in the learning science and control group without PhET simulation. The quantitative data of this research was obtained through the objective test on the mastery concept Solar system, while the qualitative data was detected through motivation rubric and questionnaire. The result shows that the students who learn the Solar system with PhET simulation have higher both improvement in conceptual understanding and motivation than without PhET simulation as teaching media. According to the analysis result, there is a moderate correlation between conceptual understanding and motivation with the learning Solar system in the use PhET simulation. Abstract: This study investigated the impact of the problem-solving model on students’ concept mastery and motivation in learning heat based on gender. The method which was used in this research was quasi-experiment with pretest-posttest design in girls and boys class. Data are collected from girl class (N=16) and boys class (N=16) of a 7th grade in one of a Bilingual Boarding School in Bandung. The quantitative data of this research was obtained through the objective test, while the qualitative data was gained through a questionnaire. Students’ motivation is measured by Attention, Relevance, Confidence, and Satisfaction (ARCS) Model. On the other hand, students’ concept mastery is measured based on Bloom’s taxonomy cognitive level through the objective test and being analyzed by using statistical software Statistical Package for Social Science (SPSS) version 20.0 for Windows 8. The results show that overall concept mastery of girls and boys students have improved. However, girls students are higher achiever than boys. Overall, the problem-solving model makes an improvement in students’ concept mastery in both girls and boys. Thus, it indicates that the implementation of the problem-solving model in learning heat can improve students’ motivation and students’ conceptual understanding in secondary level.